Techniques and monsters have one or two types, reflecting their nature, behaviour and structure. Tuxemon has five types - Fire, Earth, Metal, Water and Wood. In A, an attack is weak against the element that it Generates and strong against the element that it Overcomes. In B, an attack is weak against the element that Overcomes it and strong against the element that Generates it. In C, an attack is weak against the element that it Generates, strong against the element that it Overcomes and strong against the element that Generates it. In D, an attack is weak against the element that Overcomes it, strong against the element that Generates it and strong against the element that it Overcomes. In E, an attack is weak against the element that it Generates, strong against the element that it Overcomes, weak against the element that Overcomes it and strong against the element that Generates it. We have gone with model A at this point. While the game only has five types, the existence of two-type monsters and techniques allows for different vulnerability and resistance profiles. We can therefore represent other "types". For example, Earth-Fire techniques do half damage to Earth monsters and double damage to Water monsters. Electricity-themed techniques like Electrical Storm can be given the types Earth and Fire, to reflect the idea that water conducts electricity well, but it is earthed when it hits the ground. Earth-Metal techniques do half damage to Metal monsters and double damage to Wood monsters. ("Vermin" pseudo-type). Fire-Water technqiues do half damage to Earth and Wood monsters and double damage to Fire and Water monsters. ("Cosmic" pseudo-type). Fire-Wood techniques do half damage to Fire monsters and double damage to Metal monsters. ("Battle" pseudo-type). Fire-Metal techniques do half damage to Earth and Water monsters and double damage to Wood and Metal monsters. ("Psionic" pseudo-type). Wood-Metal techniques do half damage to Fire and Water monsters and double damage to Earth and Wood monsters. ("Heaven" pseudo-type). The Aether type is the type for special techniques for which an element is irrelevant (since they don't involve damage). It could also be used as the type for attacks that take the element(s) of its user, but this concept isn't part of the current plant. Currently, some techniques are identified as Normal or Poison type. However, it is not clear if this will continue in future versions of the game. Fire: Includes creatures associated with energy, like electricity, light and heat, dragons and other legendary beings, and poison. Water: Includes creatures associated with the sea, lakes and swamps, ice and snow, the weather, liquids like blood, and fish and amphibians. Wood: Includes creatures associated with plants, lichen and fungi, poison and venom, forests, the natural environment, the wind and flying, and the wilderness. Earth: Includes creatures associated with the ground and underground, dirt and soil, mountains and rocks, caves, and ancient and buried things. Metal: Includes creatures associated with steel, light and darkness, mechanical and robotic things, psychic powers and other unnatural things, humankind, and the undead. Some of this design space has instead been filled by dual types (see above). The Normal type would be strong and weak against nothing. Heaven: For flying, divine, weather-based, legendary, heroic, light, fairy and magical creatures and techniques. Darkness: For poisonous, evil, undead, fateful, sorcerous, shadowy, frightening and sinister creatures and techniques. With the current five types, there are a lot that fit quite awkwardly. Wood is a catch-all for nature spirits and flying things that could better go to Heaven, and Metal has abstract beings, human-like beings, corrupted or weird things, etc. It would balance out the categories too: many in Wood and Fire could go to Heaven and many in Metal could go to Darkness. We have the 5 elements "wood", "fire", "water", "metal", "earth"; these are natural. The natural tuxemon belong to these types. When the humans came, they brought something new ... a soul, which can behave good or evil. They have morality. Soon, a new wheel of elements was added, the balance of nature was changed. "heaven" and "darkness", "good" and "bad", "moral" and "corruption" ... "cathedral" and "bazaar". Soon, artificial tuxemon were created. The natural tuxemon had to live with the changes the humans brought. Since then, tuxemon adopted the types "heaven" and "darkness". All tuxemon would have a primary type, and they may also have a secondary type. 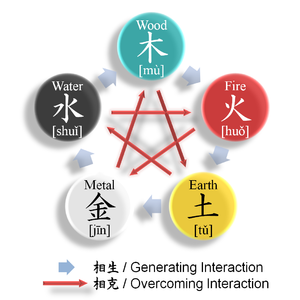 I'll be the first to admit that it lacks the simplicity and obviousness of the original Wu Xing! And we probably don't need Earth, Rock AND Metal. You could have a Poison move type despite no tuxemon having the Poison type. It could be super-effective against Wood and Earth and not very effective against Metal and Water. That would reflect that many attacks are poisonous, but having a poisonous attack doesn't make you immune to other poisons. Or you could have Flying type tuxemon, but no Flying moves. They might have 1/2 from Earth moves but x2 from Fire moves. Telefang 2 is an example of a game with technique types (Fire, Machine, Wind, etc) that are different to the monster types (Grassland, Mountain, Sky, etc). Metal, for example, also encompasses Undeath and psychic powers. How would one understand that for mechanics and lore purposes, the zombie, wizard and tank are all the same element? What is there to bridge that gap? That's not to say it can't be done, but it is tricky. Careful attention to secondary types could do it- for example, ALL undead are also part poison? But then, this means that all undead-themed teams would have to be monotype, which limits design space. What if the five primary elements were like central element schools, with subtypes for creatures beneath that? So, a trainer of the Wood school could use animals and plants, and plant-animals and wind-plants. The "Animal" type would be it's own thing, as would the "Plant" type and "wind" type, and they could mix. But at their core, they are part of the Wood type and have some things in common. Maybe they all share the same resistances, but the weaknesses of the subtypes differ? This category uses the form Type. This page was last modified on 31 March 2019, at 11:40.